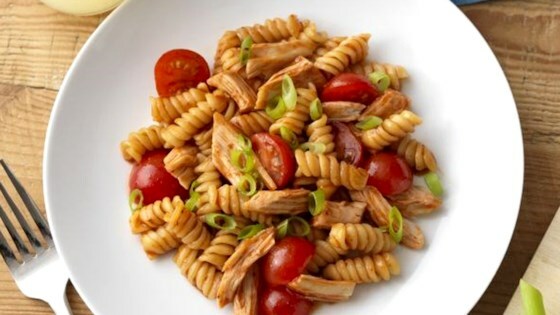 "Ready Pasta rotini combined with rotisserie chicken, BBQ sauce, and cherry tomatoes makes this the perfect quick and easy meal for busy weeknights." In a large skillet, heat the BBQ sauce, water, cherry tomatoes, and chicken until they come to a simmer. Tear open the Barilla Ready Pasta pouch and add pasta to the skillet. Heat for approximately one minute or until the pasta is warmed through. Remove the skillet from the heat, garnish with cheese, and serve.